On Friday, Roy will be dusting off the ol’ Koho’s, taking the net for the Colorado Avalanche for the first time in over a decade (since 2003, to be precise). No, the Hall of Famer is not making an NHL comeback. 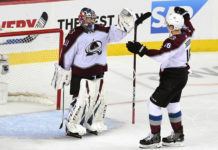 Instead, he will be suiting up for the Avalanche alumni squad, who will take on the Detroit Red Wings alumni at Coors Field. 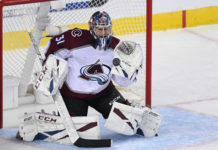 He has been preparing as of late, tending the crease during the Avalanche’s morning skates and even the occasional practice. In fact, he says that he’s been in net around 15 times to get ready for the contest. 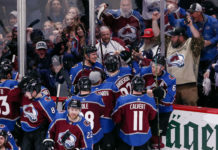 Like many of his teammates, Landeskog plans to head to Coors Field on Friday to see his coach and the rest of the Avalanche alumni take the ice (the Avalanche’s current team will take on the Red Wings on Saturday). For the fans that remember Roy’s playing days, they’ll recall the fiery competitor that he was. That fire may still burn inside of him, but that doesn’t mean people should expect another epic goalie fight. Now, that doesn’t mean that the game won’t be competitive. Let’s not forget, at its height, the Avalanche/Red Wings rivalry was one of the most intense in all of professional sports. The wounds for the alumni’s playing days may have all healed, but scars are forever.